No Wonder They Call Hedge Funds 'Smart Money'! This phrase is used to describe the handful of professional investors whose abilities and foresight are thought to be so acute that they spot the big money-making opportunities before the average Joe Pro. The smartest of the “smart money” is thought to be hedge funds. A look at recent performance suggests that hedge funds are indeed extremely smart money, though not in the way that most people think. As the chart below shows, on average, hedge funds are no smarter about picking stocks or other investments than anyone else. In fact, they’re decidedly, startlingly worse. 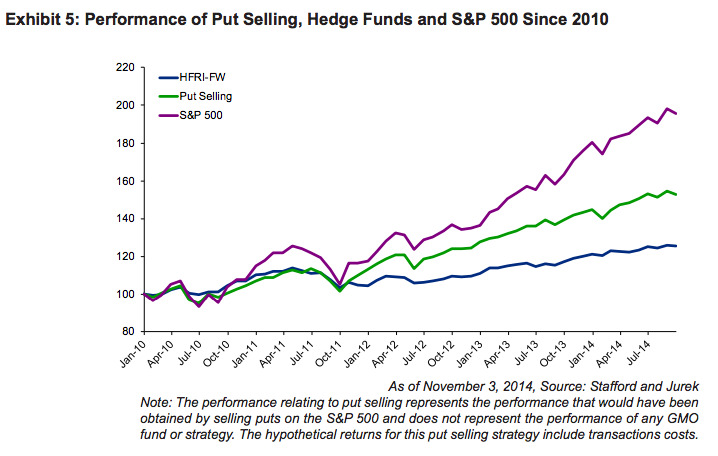 But hedge funds are absolutely brilliant money-making opportunities for those who run and work for them. The fees on a well-run S&P 500 index fund are about 20 basis points a year. That means that, every year, for every $US1 billion a fund has under management, the fund manager makes $US2 million. The annual fees on a dime-a-dozen hedge fund, meanwhile, are “2 and 20” — 2% of assets and 20% of any gains, regardless of whether the gains are the result of the fund manager’s activities or simply a rising market. That means that, for every $US1 billion under management, the hedge fund rakes in $US20 million per year. And if the market should rise, say, 20% in a year, the fund will collect another $US40 million. Put differently, in a year in which the market goes up 20%, the manager of a $US1 billion S&P 500 index fund will make $US2 million. The manager of a hedge fund that performs in line with the market, meanwhile (which most haven’t in recent years), will make $US60 million. Needless to say, those fees come right out of the client’s return.